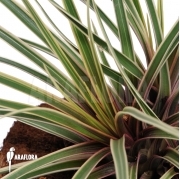 This eye-catching exotic plant is an an easy-to-care-for Tillandsia for in the terrarium or on a bright window sill. The inflorescence of Tillandsia leiboldiana var. guttata is a striking red with purple flowers. Due to this broliad’s small size Tillandsia leiboldiana is also a good choice for a smaller terrarium. Especially poison dart frogs will feel at ease between the bracts of this plant, and will eventually lay their eggs there. 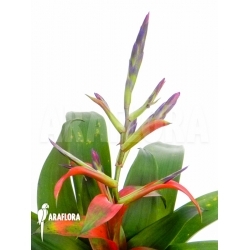 In a tropical terrarium this small to medium-sized bromelia requires a bright spot with a high humidity. Because Tillandsia leiboldiana doesn’t grow too tall, this plant is also well-suited for a smaller terrarium. The inflorescence can is no less than spectacular: brightly colored bracts interspersed with purple flowers. This bromliad’s green leaf is often emblazoned with dark spots on the outside. Tillandsia leiboldiana can also be kept in the living room as a house plant. The original habitat of this bromeliad is Central America. Preferably, there should always be water in the chalice of Tillandsia leiboldiana. This bromeliad likes a bright spot. If the roots are kept too wet, they’ll die off quickly. Daily watering is, however, recommended. Extra fertilization is not directly required. It is possible to keep the plant in the soil substrate, but it is done most justice if it is allowed to grow in its natural style: epiphytically. This plant can be placed on the backwall (preferably of fern root or other moisture-absorbing material) or on an epiphyte trunk.